April’s Butterfly of the Month is Danaus plexippus, the Monarch. How to Attract them to Your Backyard: Ann recommends milkweed and lots of it! If you aren’t a fan of common milkweed, check out butterfly weed. It’s attractive, and the monarchs will love it. She also recommends planting the milkweed in patches, not just single plantings. In addition to milkweed, have lots of colored flowers available…zinnias are a wonderful nectar source. Season: End of May through September in Massachusetts; In fact, you may see even more in September as the individuals in Canada begin their migration. They are the only butterfly in the world to have a true migration. We’ll discuss this migration in greater depth this fall! In Our Habitat: The monarchs are a pleasure to have in our habitat! They are very social butterflies and interested in people. They love the sun and warm temperatures, so tend to be more active in the afternoon on sunny days (~11am to 4pm), particularly when temperatures are in the 70s. You can often find them enjoying the sun by hanging on the screens, or eating from brilliantly colored flowers. They get pretty engrossed in eating, so are easy to photograph. Ann has placed zinnias both in hanging baskets, and close to the floor, so there are plenty of opportunities for viewing! Be sure to stop by to see our monarchs starting in May! March’s Butterfly of the Month is Polygonia interrogationis, the Question Mark. An orange question mark butterfly on a leafy twig. Range: They can be found throughout the entire eastern United States, as well as in very northern Mexico, and southern Canada. How to Attract them to Your Backyard: If you happen to have an Elm tree in your yard, you are off to a good start. We find a combination of elm and false nettle does a great job of attracting question marks for us. Female vs. Male: No easily noticed visual difference. If disturbed in the chrysalis state, they wiggle like crazy! You don’t even need to touch them, just be near by. In Our Habitat: Question Marks are easy to spot when the weather is cool, but sunny. 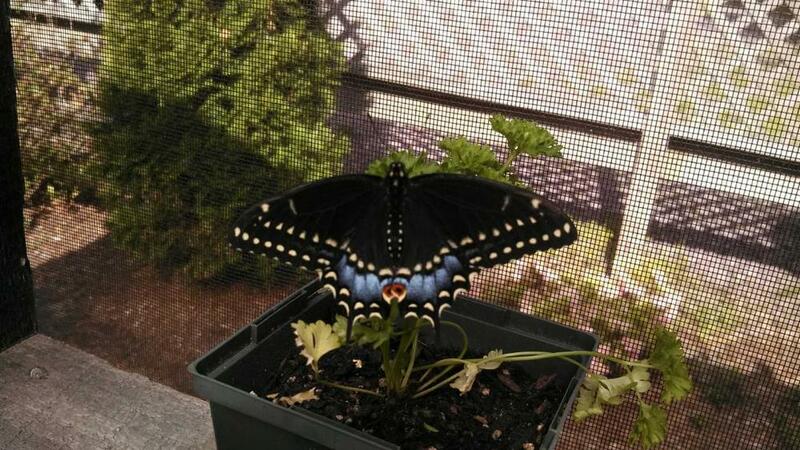 They are very active butterflies and not at all shy of people. They can often be found on the plate of fruit. They tend to be sluggish when the weather is hot & humid (who isn’t?). Be careful though, their appearance when closed is very different than when open, they might confuse you. The Mourning Cloak, Nymphalis antiopa, is our butterfly of the month for February. Range: Mourning Cloaks can be found all over North America, though they are rare on the gulf coast. They can even be found in temperate regions of Europe. They can be found in forests, parks, in your backyard- wherever their host plants are found. In Britain, they are referred to as the Camberwell Beauty. How to Attract them to Your Backyard: You will have better luck attracting Mourning Cloaks to your yard if you already have the specific types of trees they enjoy near you. If you happen to live near woods, or have a Common Willow, Elm and Corkscrew Willow in your yard, you are more likely to see them. Additionally, making sure your yard has plenty of places where they can find shade and cool temperatures. You may also wish to place a plate of rotting fruit (especially bananas) outside. Just make sure to keep an eye on it and bring it inside at night, so you don’t attract any unwanted pests! May be confused with: Mourning Cloaks are pretty distinct and unlikely to be confused with any other species. Female vs. Male: There is no easy visual way to tell the males and females apart. One of the few species that overwinter instead of flying south or dying off before winter, the adults hibernate in tree cavities or under bark. In Our Habitat: We learned early on that the caterpillars do not do well if you separate them. We let them stay in communal groups and make sure there is enough food for everyone. The younger butterflies have a beautiful blue band on their wings that fades as they get older. They can “play possum” when they feel threatened- many other butterflies will attempt to fly away, but the mourning cloaks will be extremely still (even falling over when moved). Mourning Cloaks are easy to find and photograph- just head over to the plate of bananas and watch them eat! “Attributes of Nymphalis Antiopa.” Butterflies and Moths of North America. Web. Feb. 2016. 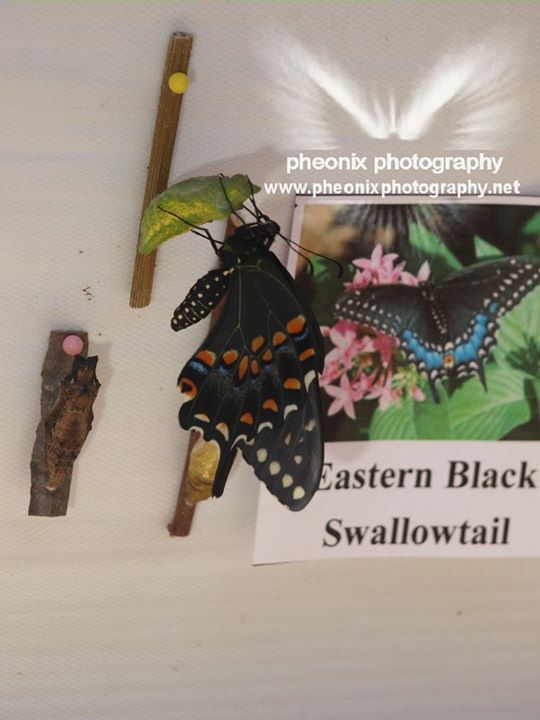 <http://www.butterfliesandmoths.org/species/Nymphalis-antiopa&gt;.